Please help me Identify this William Moorcroft Bowl Pattern. I bought this beautiful William Moorcroft bowl at a garage sale last year for $2. I knew the name, and thought it was a very pretty piece. 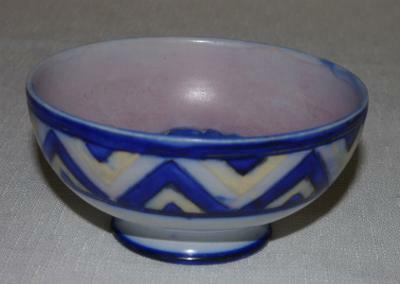 The bowl is 10.5 cm diameter, 5 cm tall. None of the local antique “experts” can tell me anything about it. All they say is that it is old, and it’s in beautiful shape, and it must be rare because they have never seen that pattern before. 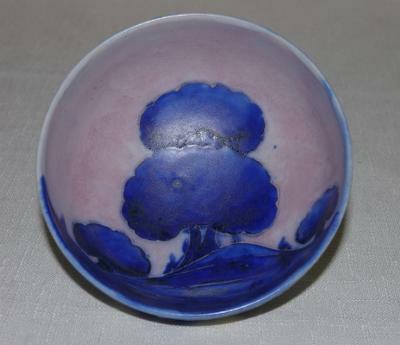 The closest Moorcroft pattern I have found to this is Moonlit Blue, and even that isn’t so close. I have done some research on the mark, and it seems to be William Moorcroft’s initials mark, based on the shape of the W.
I would appreciate any information on this beautiful William Moorcroft bowl, including but not limited to age, maker (William or Walter? ), line, and even value. Thank you for letting me share my amazing find. Your bowl is a lovely looking example of the William Moorcroft Dawn design and if the bowl is in excellent condition would be very collectable. I have two examples in my own Moorcroft collection, which numbers about sixty pieces, and they are probably two of my favourite Moorcroft pieces. 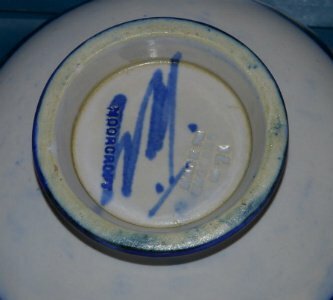 Hi, What a lovely bowl you have picked up and for a great price, congratulations! This is a William Moorcroft piece and is known as the ‘Dawn’ pattern. Very similar to both Moorcroft’s ‘Moonlit Blue’ and ‘Eventide’, so you were not far away. He produced the three patterns, one repesenting sunset/duck, the other night time and Dawn as morning. They are desirable patterns to collectors, such as myself and this piece was introduced in 1925/26. It is a salt glaze finish, which wasn’t as successful for Moorcroft as their highly famed glazed and flambe finished pieces. Is the piece in good condition? The blue sgwiggle on the base is William’s initials and it should have Moorcroft/Made In England impressed also. Value would vary depending on condition.